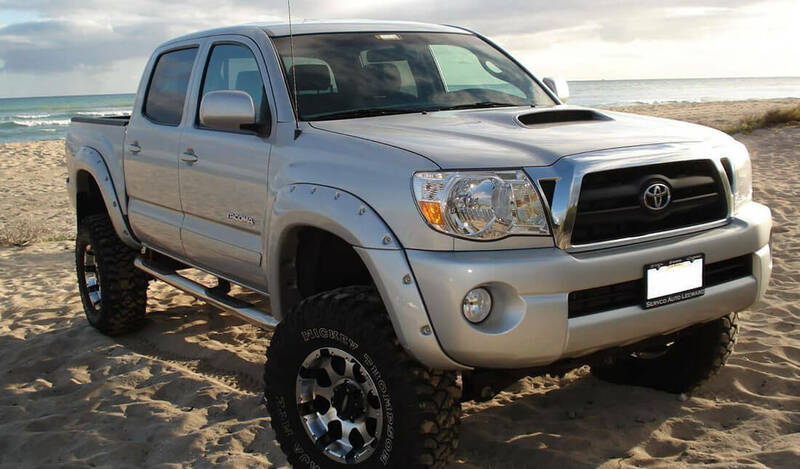 Bushwacker has been focused on providing quality truck accessories for over 40 years. Today, that translates to 7 premium fender flare lines, with other complementary product lines such as bed rail caps, bumper protection, and Jeep accessories. Constant research & development keeps Bushwacker in front of its competition. Shield your fenders against scratches and dents from road debris. 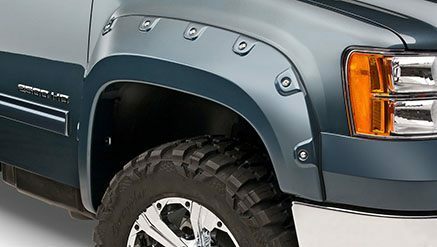 Equip it with the original Bushwacker Pocket Style® Fender Flares for a distinctive and subtle look. 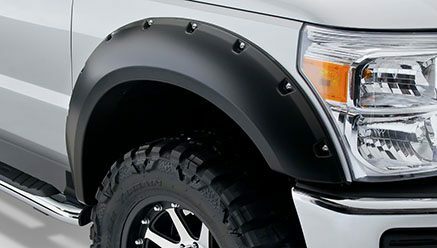 These fender flares are sold as a set to allow simultaneous installation and protection, and designed with recessed bolts for a more discrete appearance. For vehicles with huge tires, this is the perfect protection for you. With its Dura-Flex material and bolt-on style, you are guaranteed maximum protection and at the same time, a rugged style that will enhance your vehicle more. Add some flare on your traditional "inverted" style fender flares! 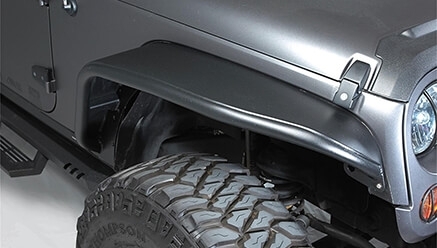 Bushwacker Boss™ Pocket Style® Fender Flares features an aggressive "raised" pocket styling that provides the rugged look that most truck enthusiasts will love. 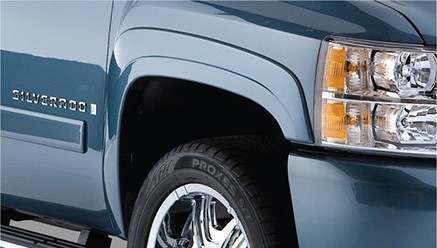 With Bushwacker Boss™ Pocket Style® Fender Flares, you can drive around like a boss! Made from Dura-Flex® 2000 material that ensures "no chalking"
Enjoy additional tire coverage on your ride with Bushwacker Cut-Out™ Fender Flares! These flares are designed for off-road use by optimizing wheel articulation for excellent driving experience. Made from heavy duty Dura-Flex® 2000 material, Bushwacker Cut-Out™ Flares will guarantee a long-lasting performance. Add fender protection to your ride without affecting its factory look. 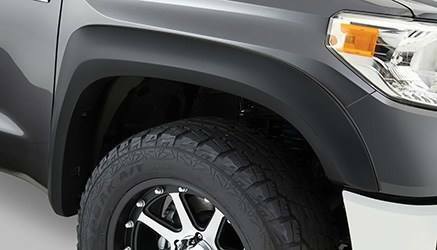 Bushwacker offers the OE Style® Fender Flares that give the needed protection while keeping your vehicle's over-all OE appearance. It features TPO construction (Dura-Flex® 2000) with UV-protected matte black finish that will prevent cracking, warping, and fading. Made for serious off-roaders, Bushwacker Extend-A-Fender® Flares provide fender protection, even more than you can ask for. Aside from the extra tire coverage, Extend-A-Fender® Flares also provide extensive wheel protection for larger tires. It also features a factory matte black finish that gives you the freedom to paint it and match your vehicle! Make your Jeep the best-looking one among your fellow off-road enthusiasts. Equip your fenders with Bushwacker's top-of-the-line Flat Style Flares! 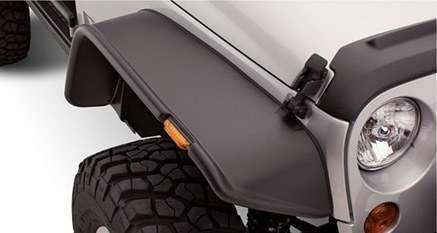 These fender protectors are designed to give your Jeep the rugged look it needs while adding tire coverage at the same time. Flat Style Flares is also built to work perfectly with the OE inner splash guards to further cover-up your engine parts. 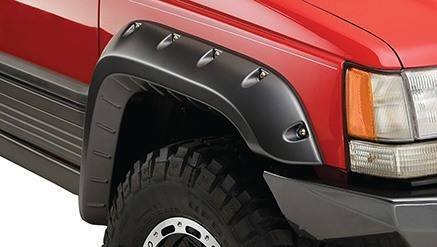 For extreme tire coverage and protection, Bushwacker introduces their Aluminum Tube Fender Flares. These flares bring more durability and protection. Made from premium high-quality aluminum, you are guaranteed strength that can last for many years and withstand harsh road elements. A perfect addition to your vehicle during your off-roading and trail adventures. 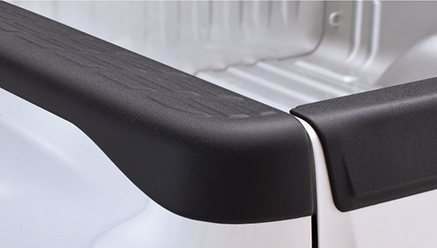 Protect your bedrails and tailgates against scratches and nicks when loading cargo or even with simple accessing of the truck bed. Bushwacker Ultimate BedRail and Tailgate Caps are meticulously crafted to provide maximum protection with a wider coverage than OE caps. 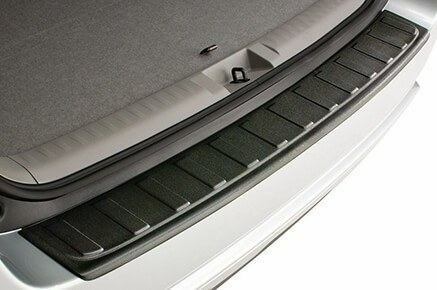 Each bedrail and tailgate caps are UV protected to withstand extreme weather conditions with unfaltering functionality. Protection and style rolled into one! Your bumper is one of your vehicle's most vulnerable points, especially if you regularly load and unload cargo. Whether it's you or someone else, it's just a matter of time before your bumper receives some scratches and dings. The Bushwacker OE Style Bumper Protector hides your existing scratches and prevents future ones, all while maintaining the OE factory look of your vehicle. If you're like most Jeep owners, you like to take your Jeep on the trail or parade it around with some added style. 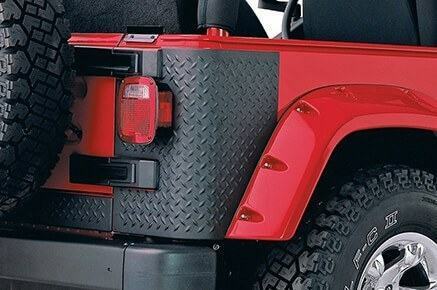 Bushwacker's TrailArmor® for Jeeps provides the extra protection your Jeep needs on the trail and on the road - including front and rear corners, rocker panel guards, door sill guards, hood scoops, hood protectors and other accent pieces. Mix and match to get as much protection as you need. All pieces install easily with 3M automotive grade adhesive. When it comes to off-roading parts and accessories, Bushwacker is the name you can count. 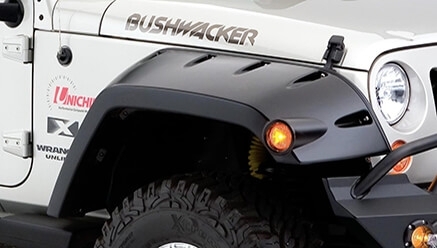 For over four decades, Bushwacker has developed and manufactured high quality Fender Flares, Bed Rail and Tailgate Caps, bumper protections, and other off-road accessories that are needed by enthusiasts. These products are precisely engineered for custom fitment that will give your ride the look that you desire. For more information on Bushwacker, please visit the Bushwacker official website.